The wife and daughter of one of many missing persons in Kashmir at a sit-in protest in Srinagar. Credit: Athar Parvaiz/IPS. In the conflict-scarred India’s border state of Jammu and Kashmir, ‘disappearance’ is a loaded word. 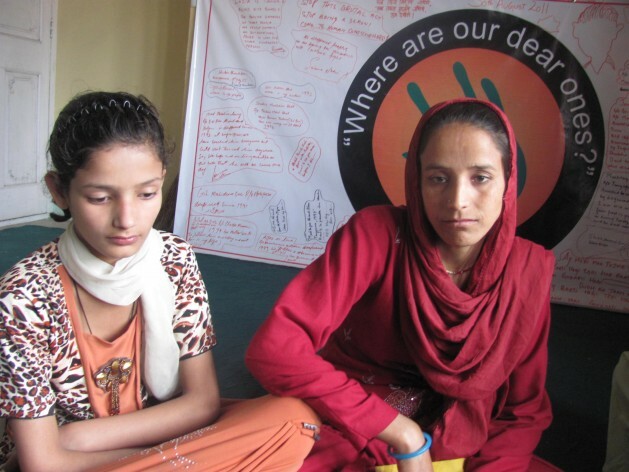 According to the Srinagar-based Association of Parents of Disappeared Persons (APDP), more than 8,000 people have gone missing in the state. Emotions are running high after the Indian Army closed what is called the Pathribal case, giving a clean chit to five of its officers who were accused of killing five innocent Kashmiri civilians in what was reported to be a staged, extra-judicial killing in March 2000. “We had no expectation from this inquiry,” Rashid Khan, son of one of the victims, told IPS. Justice Rajindar Sachar, former President of the People’s Union for Civil Liberties (PUCL), said the self-acquittal by the army would only aggravate the sense of alienation and resentment among Kashmiris. Kashmir has been at the centre of a bloody conflict between India and Pakistan for decades, almost since the two nations became independent from the British in 1947. An insurgency has claimed thousands of lives since it broke out in 1989, with the rebels demanding ‘freedom’ for Kashmir. The region has seen heavy mobilisation of troops by the Indian government. In the Pathribal case too, the victims had gone missing after being picked up by “unknown gunmen”. Soon after, the Indian Army filed a first information report with the police claiming it had killed five ‘militants’ of the terror outfit Lashker-e-Toiba, which has its bases in Pakistan. The army action was reported to have been carried out at Pathribal village. The army, according to local witnesses, had burnt the bodies of the victims beyond recognition. Massive demonstrations were held by locals who demanded exhumation of the bodies for identification. The bodies were finally exhumed following the protests. DNA tests were carried out, but repeated tampering of samples prolonged the investigation for two years. The state government later handed over the case to India’s Central Bureau of Investigation (CBI), which established that the bodies were those of the five missing civilians. After the CBI filed a charge-sheet against five army officers, including two brigadiers, the army challenged the indictment. It got permission from India’s Supreme Court in 2012 to court-martial the five officers according to its own legal procedures. But in January, the army gave a clean chit to all the accused. “There is no evidence on record which in any way connects any of the five accused persons with the charges of murder, wrongful confinement, abduction or causing disappearance of the five deceased persons,” the army said while declaring the case closed. The decision has shocked many, though some relatives of victims say they are not surprised. “Once the army decided to probe it further, despite CBI’s thorough investigation, our hopes were crushed,” said Rashid Khan. From human rights groups in Kashmir and New Delhi to political parties, many have reacted strongly. “This is strange. How can the army deny what the CBI has clearly established? I think this will undo all the goodwill the army has earned,” said Kashmir Chief Minister Omar Abdullah. The CBI says it will not say anything until it gets directions from the Supreme Court. “We will do whatever the Supreme Court asks us to do,” Kanchan Prasad, the CBI spokesperson told IPS. According to Nayeem Akhtar of the Peoples Democratic Party (PDP), had justice been allowed to prevail in the Pathribal case, it could have been a game-changer in Kashmir. “After all, it was perhaps the first case among thousands that was allowed to be investigated freely,” he told IPS. Civil rights groups are now worried about another court-martial being conducted by the army in a similar extra-judicial killing pertaining to Machchil area in north Kashmir. In a study based on official documents, acquired through the path-breaking Right to Information (RTI) law of the Indian government, the International People’s Tribunal for Human Rights and Justice in Kashmir says there is an overwhelming reluctance to genuinely investigate or prosecute the armed forces for human rights violations. “We filed an RTI seeking information about the results of inquiries in different cases from 1990 to 2011,” Khurram Parvez, convener of the Srinagar-based Coalition of Civil Society (CCS), told IPS.